Gareth Pugh, l'enfant terrible emerged onto the fashion scene and managed to gather lots of fans but. also. to. build. high. We find ourselves inspired by anything that moves (or not) out there. I'm not stating this or that looks architectural for nothing. 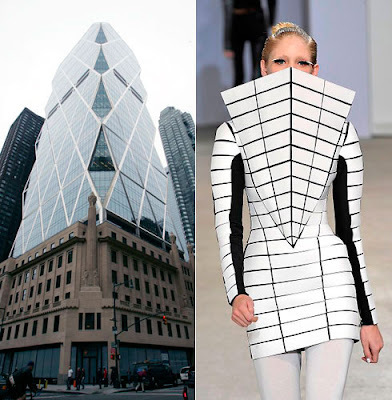 The Moment makes an overview upon the major direction lines which bring fashion and architecure together. Whoaha. Fabrics as a building materials, creating both hard and round lines. Oversize proportions, exaggerated angles and swooshy layers. Strong silhouettes with emphasis on structure, shape and form. Major pleats, folds, pinning, layering, surface texture and three-dimensional designs. Gianfranco Ferré (1944-2007) aka "the architect of fashion". "dressmaking is the architecture of movement"
"nothing is more important in a dress than its construction"
Both Balmain and Ferré held degrees in architecture. I would also like to add Hussein Chalayan because I admire his work and projects. Gianfranco Ferré back in September. Sandra Backlund back in May. Gareth Pugh! Definitely worth watching.